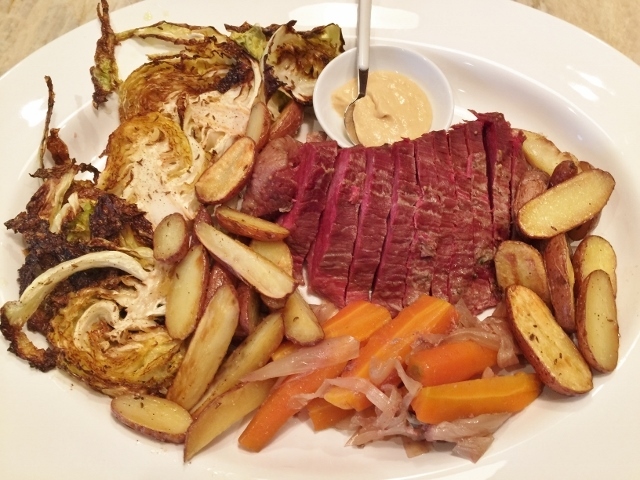 Slow Cooker Corned Beef with Roasted Cabbage & Potatoes - Recipe! - Live. Love. Laugh. Food. I love celebrating St. Patrick’s Day, even though I don’t have much Irish in me. Corned Beef and Cabbage is the most traditional meal of the holiday and I usually do partake once a year. Corned beef is basically, brisket that has been brined for several days or up to a month. 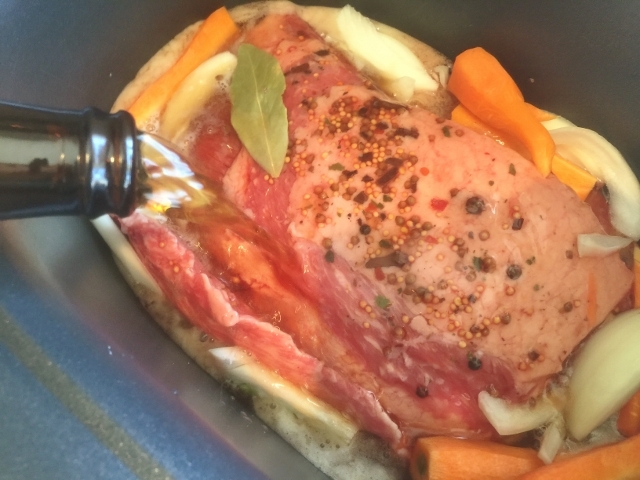 I remember a couple of years ago, I decided to brine my own corned beef, so I put together my own pickling mix of salt and spices and submerged my beef. My recipe required me to flip the brisket over every other day and by the time St. Patrick’s Day came, it was ready to cook. The recipe turned out delicious, but I decided through the process just to buy a brined corned beef and focus on making the vegetables much more tasty. In this recipe, cooking the corned beef and cabbage with potatoes is a snap, but it requires two cooking methods – a slow cooker or stove top pot and a sheet pan to roast the veggies in the oven. 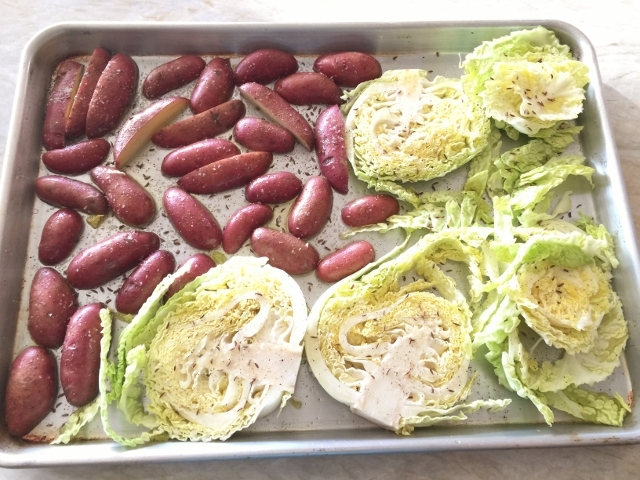 The time it takes to prepare this recipe is almost as fast as dumping all the ingredients together in one pot, like in a standard recipe, but the advantage of roasting the cabbage and potatoes separately, is worth the effort because of the end result – crisp tender vegetables. So, go and buy your corned beef – just make sure you put a little effort into the veggies, it’s well worth it! Happy St. Patrick’s Day! 1. Slice onion thinly and wash, peel and cut carrots in half. 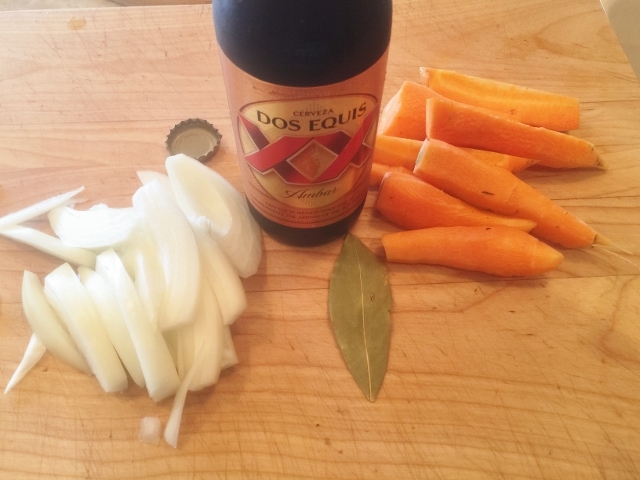 Remove corned beef from any packaging and place in slow cooker with the onions, carrots, bay leaf, beer and 12 ounces of water. If cooking on the stove top, add all ingredients in a large pot. Place lid on slow cooker and cook on low for 6 hours. If cooking on the stove top, place lid on the pot and heat until lightly boiling and turn heat down to simmer, cook for 2-3 hours. 2. One hour before corned beef in done, preheat the oven to 425 degrees. 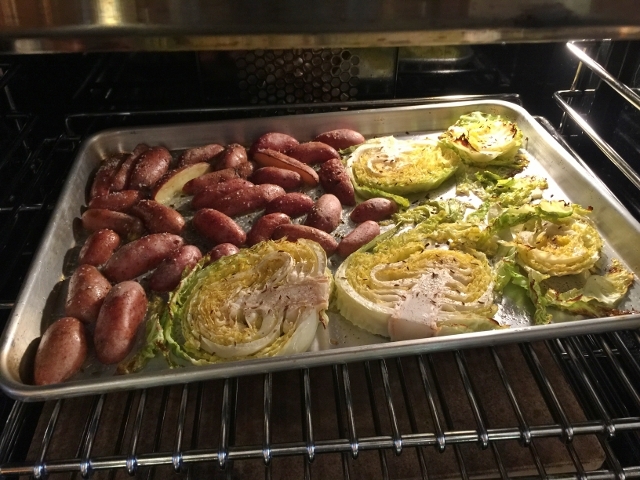 On a sheet pan, add the sliced cabbage and potatoes. Drizzle the vegetables with olive oil and sprinkle with caraway seed, salt and pepper. 3. 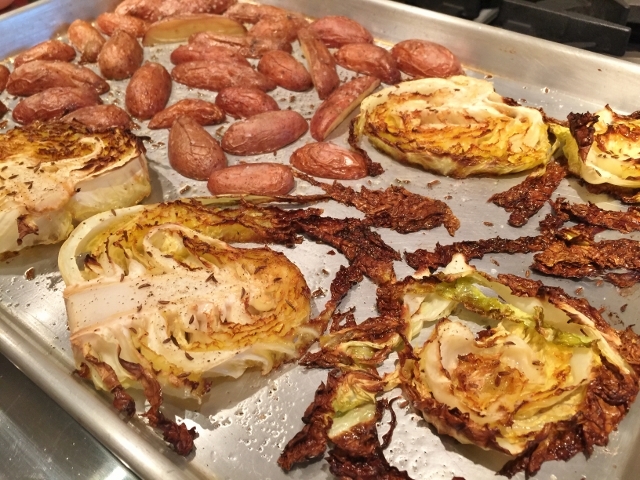 Place sheet pan in oven and roast vegetables for 40 minutes or until golden brown. Some of the edges of the cabbage will get very dark brown, they taste like cabbage chips! Remove the vegetables from oven. 4. 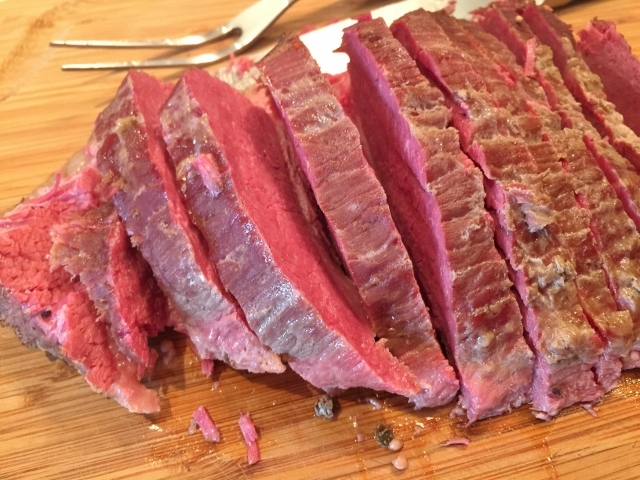 Remove corned beef from slow cooker or pot and place on a cutting board. Slice into 1 -inch thick pieces. Remove carrots and onions, using a slotted spoon to remove most of the liquid. 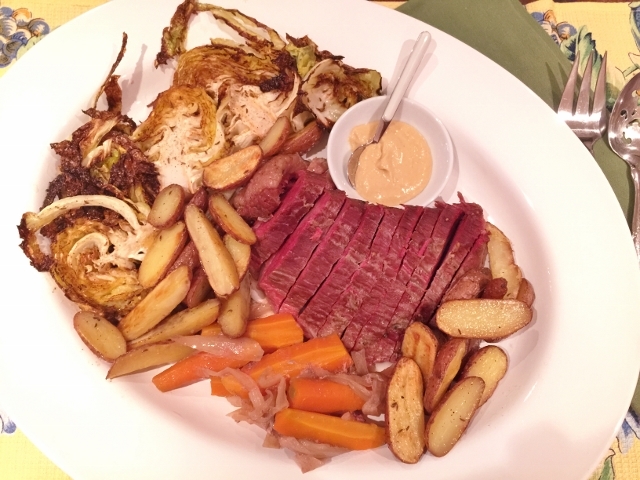 On a large platter, arrange the corned beef, carrots & onions, roasted cabbage and potatoes. 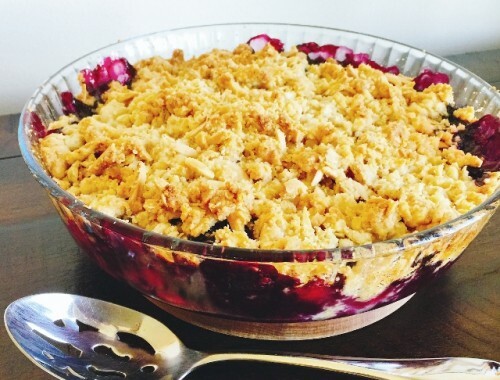 Serve with your favorite mustard or soda bread. Enjoy! 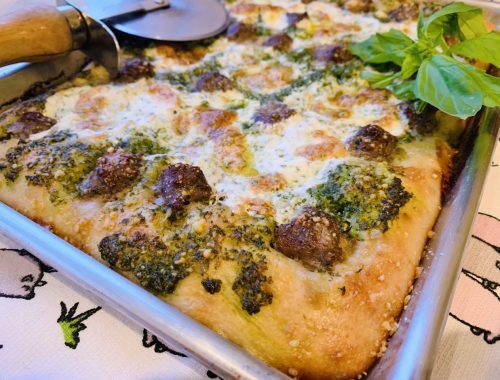 Sheet Pan Pesto Sausage Pizza – Recipe! 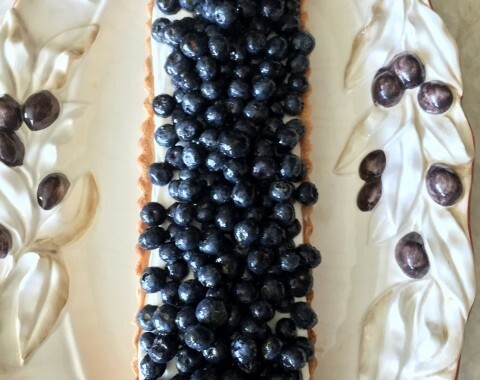 Blueberry Creme Fraiche Tart – Recipe!